If you have a sweet tooth, then this dessert is for you. Hot meringue and a base of moist banana loaf cake (sold in the bakery section with the prepacked cakes) cleverly encase cold ice cream. The meringue stops the ice cream from melting while it's flashed in the oven. Preheat the oven to 220°C, gas mark 7. Cut the loaf into 1.5cm thick slices and use to line a 20cm shallow ovenproof dish or flan tin, cutting pieces to fit and pressing down well (you may not need to use the whole loaf). Remove the ice cream from the freezer to soften slightly. In a large bowl, whisk the egg whites until stiff peaks form, then gradually whisk in the sugar, a tablespoon at a time, until the meringue is glossy and firm. Quickly pile large scoops of ice cream in a mound in the centre of the cake, leaving a 5cm border around the edge. 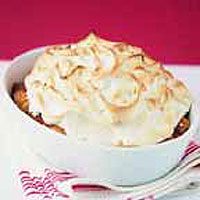 Cover the ice cream with the meringue mixture, spreading it to ensure that the ice cream is completely sealed in. Bake for 7 minutes until the meringue is golden and crisp. Serve immediately.